Customers considering adding third-party technologies to their Avaya solution can be confident that the Contact Canvas solution is compatible, proven and tested. 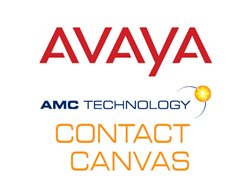 AMC Technology is a Technology Partner in the Avaya DevConnect program—an initiative to develop, market and sell innovative third-party products that interoperate with Avaya technology and extend the value of a company’s investment in its network. Avaya is a leading provider of solutions that enable customer and team engagement across multiple channels and devices for better customer experience, increased productivity and enhanced financial performance. Its world-class contact center and unified communications technologies and services are available in a wide variety of flexible on-premise and cloud deployment options that seamlessly integrate with non-Avaya applications. The Avaya Engagement Environment enables third parties to create and customize business applications for competitive advantage. Avaya fabric-based networking solutions help simplify and accelerate the deployment of business critical applications and services. For more information please visit http://www.avaya.com. AMC Technology is a global leader in contact center and CRM integration with over 20 years of experience. AMC powers contact centers and customer interactions for companies around the globe through certified products and unparalleled expertise. AMC’s Contact Canvas™ product suite allows customers to integrate CRM and communication platforms, including CTI, across the enterprise, for call center agents, knowledge workers, and mobile staff. Our products are certified by our partners and allow businesses to more effectively manage all types of customer relations while delivering superior levels of customer service and improving productivity.